"It was the ideas of Moley, the trade unions, Stuart Chase, Tugwell, Stalin, Insull, Teddy Roosevelt, Henry Ford, and Mussolini's Italian model all rolled into one." The book begins with a hanging, a 13-year-old boy driven to suicidal despair by all he saw around him. There's no better way to start recounting a national tragedy. Like that hanging, the catastrophe of America's Great Depression was also completely avoidable. For the Great Depression was also man-made, as Amity Shlaes shares in her superbly researched, half-a-decade–in-the-making book, The Forgotten Man. The title of the book refers not to FDR's famous use of the phrase to denote the "little guy" that he promised to look out for, but to the rarely remembered William Graham Sumner's use of the term in his 1883 speech, "The Forgotten Man." Sumner used the term to denote the sucker who had to pay for all the promises that men like FDR dream up. Released in 2007, the book reached best-seller status, and for good reason. Rivalling Murray Rothbard in her preternatural urge to collect research data, Mrs. Shlaes immersed herself in her study and it shows. Though clocking in at an eminently readable 383 pages, the book is brimming with both high facts of great import and the low, pleasing, smaller tidbits that bring the people and time she writes about into a clear focus. The historian G.M. Young once summed up his research methodology as "read until you can hear them talk." Mrs. Shlaes's work is the best example of that approach I have yet found. She unearthed her subjects' actual words in order to bring every one to life. This is not very flattering to most of them. Some come across as decent men: Utilities baron Sam Insull "established power prices that were acceptable to the small consumer" (p. 22). Treasury Secretary Andrew Mellon personified "thrift that emphasized the accumulation of capital" (p. 25). And Brooklyn's Schechter brothers, an innocent family of kosher butchers, were arbitrarily selected by FDR for extralegal destruction. But mostly the people she profiles are far from decent. This book shines sunlight into dark corners, and 1930s America had a lot of those. Mrs. Shlaes quotes the poet W. H. Auden's summation of that time as "a low dishonest decade" (p. 363). It was so only because of the people who came to prominence during it. From odious Louis Howe, FDR's right-hand man, to the vile Robert Jackson, FDR's political attack dog at the Bureau of Internal Revenue, to the bureaucrats and inspectors FDR hung as millstones about the necks of the working masses, the Roosevelt administration made its mark. Mrs. Shlaes intends for the reader to come away feeling that "this book is the story of … the Progressive of the 1920s and 1930s, whose good intentions inspired the country," and even more the story of "the American who was not thought of" (p. 13). I did not view her book that way. Due to the massive influence and great charisma of FDR, everyone else profiled in the book is a satellite, tiny and respectful, orbiting the giant sun that was the president. Paul Conkin once wrote, "The New Deal was an exceedingly personal enterprise … unified only by the personality of Franklin D. Roosevelt." Any book about the New Deal must, by its very nature, be all about Franklin. So to me, while The Forgotten Man may occupy a place in the reviews as an economic history of the Great Depression — which it is up to a point — more than anything else it is a character study of the one man who above all defined and shaped the New Deal: Franklin Delano Roosevelt. And the book reads as a 383-page indictment of him. Amity Shlaes relentlessly slaps down the cards as they come off the deck and presents all the evidence dispassionately with no screams and no cries of alarm. By letting the facts quietly speak for themselves, the book sounds off at an ear-splitting volume. Some of those facts will make your blood boil with indignation, others will give you nothing but a sense of depressing familiarity. But always, from cover to cover, The Forgotten Man does much to bring out admiration for Mrs. Shlaes's honesty as a historian. "There's no law, no law anymore. I wanna steal from the rich and give to the poor." With the possible exception of Al Capone's Chicago gang, 1930s America saw no greater pile of buccaneering stickup men and rogues than those with whom FDR surrounded himself. As one of the book's central themes, Amity Shlaes condemns them for introducing "regime uncertainty" into the economy, thereby exacerbating the Great Depression. Keep in mind that "regime uncertainty" is but a euphemism for "utter lawlessness." This "regime uncertainty" was a direct result of the ideological underpinnings of FDR and his Brain Trust. In one of the book's most devastating chapters ("The Junket") Mrs. Shlaes gives a brief intellectual history of those men and their ideas. Suffice to say that during the 1920s and 1930s, the chatterers at Ivy League cocktail parties — and around FDR's dinner table — were decidedly smitten with Joseph Stalin and Benito Mussolini. One of the men Schlaes profiles is Rex Tugwell, a future prominent member of FDR's Brain Trust. While in Stalin's Russia, Tugwell looked about with open admiration. "I knew from then on how determined dictators come to manage a people" (p. 73). His admiration for raw power was par for the course among FDR and his cronies. Roosevelt himself declared during his 1936 campaign, "we are fashioning an instrument of unimagined power" (p. 299). Throughout the book, Shlaes demonstrates that FDR considered the law not as something to be respected and adhered to, but as something to be cynically manipulated or ignored at leisure. In his hands, the law became a weapon to be used against his enemies and other, arbitrarily chosen targets. During his first year of rule alone, "10,000 pages of law had been created" (p. 202), and an army of bureaucrats and police had been raised to enforce them. America in the Great Depression became a land covered by innumerable laws while sliding into the lawlessness of the NRA (National Recovery Administration). The NRA was FDR's favorite legislative pet. In it, he put his admiration of Mussolini's fascist model into action. Mrs. Shlaes pointedly notes that FDR's economic interventions were "often inspired by socialist or fascist models abroad" (p. 6). By 1940, America had learned about FDR & Friends that "unpredictability was the only thing you could be sure of" (p. 374). While FDR would repeatedly announce that "we are bringing order out of chaos" (p. 208), Mrs. Shlaes shows unequivocally that his blasé attitude towards the rule of law was doing quite the opposite. How could the economy recover when FDR's own attorney general went into a court of law and sneered at "the supposed sanctity and inviolability of contractual obligations" (p. 233)? Mrs. Shlaes highlights the lawlessness of the Roosevelt administration best in her retelling of the inhumane, heartless attack launched by FDR against the Schechter brothers. The Schechters were a Brooklyn Jewish family of hard-working, mildly successful poultry dealers who were pious in their faith, polite to their customers, honest in their dealings, and who minded their own business. The Schechters were everything that the New Dealers were not, and they were to be persecuted entirely for political reasons. Walter Rice, FDR's special prosecutor, "was targeting them" (p. 219). One member of FDR's ring later admitted in court that it was all planned beforehand, with his superiors even saying that "we are going to get an indictment and convict the Schechter brothers and that will be a whip over it" (p. 204). The indictment against them was "vague and lengthy" (p. 219). The brothers stood accused for, among other crimes, "competing too hard" (p. 221). In a Kafkaesque trial where the judge clearly sided with the federal prosecutor, "both Rice and the judge had sought to use the Schechter's social class against them" (p. 223). But despite all the money and power that FDR and his blue-blooded, country-club friends arrayed against the working-class Schechters, the "little guy" fought back all the way to the Supreme Court. And the Supreme Court gave one last kick on behalf of the workers, not only freeing the Schechters from persecution but striking down the NRA as well. Once the Supreme Court did its duty, "some 500 cases against people charged with breaking NRA codes were now dropped" (p. 244). And that 500 is where I lost any shred of respect that I might still have harbored for FDR. The fact that he threw a snit when the NRA was struck down proves that it was no mistake, and that the prosecutions were not driven by some overzealous subordinate who had got out of hand. FDR liked to be in the thick of his show trials. The book recounts how FDR would rein in or goad his prosecutors — targeting his chosen enemies, leaving his friends be (p. 344). Our Founders wrote the Constitution with exactly FDR's type in mind, but forget for a moment the unconstitutionality and lawlessness of it all. Concentrate on FDR's "criminals": the poor tailor Jack Magid, thrown into prison for the crime of pressing a suit for a price FDR didn't approve of; the old age pensioners cast into poverty by FDR's deliberate actions against the businesses their retirement savings were invested in; and all those peoples' families, who suffered along with them. Concentrate for a moment on the fact that there was "anger that the price (of meat) was so high" (p. 221) due to FDR's deliberate policy of paying farmers to destroy food during a time of hunger. Notice how the "argument was valid" that "the NRA helped big business at a cost to smaller businesses" (p. 227). And laugh at the wonder of it all, that this man is still regarded as a "friend of the people." H.L. Mencken once observed that the great thing about democracy is that the people get what they deserve — good and hard. Mrs. Shlaes never lets the reader lose sight of the fact that while FDR ushered in the final destruction of the Republic, the American voters, for whatever reason, wanted FDR, loved the New Deal — and still do to this day. Like any successful politician, FDR had a nose finely attuned to the prejudice of the voters; condemning his chosen enemies in court or in the press became part of the show. "The routine of targeting class enemies in the name of reform would become Roosevelt's hallmark" (p. 133). For the unfortunate souls caught up in the machine, guilt or innocence was beside the point, as when Henry Morgenthau, Jr. (FDR's secretary of the Treasury) stated, "I consider that Mr. Mellon is not on trial but democracy and the privileged rich [are] and I want to see who wins" (p. 196). FDR's assault on the well-to-do struck the nerve of envy. It was a classic case of "divide and conquer," and the American voters loved the spectacle of formerly wealthy men humiliated in court for crimes mostly created for the show. No public hanging has ever gone wanting for a crowd, and as "there was a new national feeling … that the time had come to target some of the wealthy" (p. 124), FDR eagerly played to the mob's wishes. FDR comes across as a man infected with an endless drive for power. He was a consummate politician lucky to be "a great radio speaker born into the era of radio" (p. 129). And he had a moral character and sense of honor that would make a pimp blush. We have never stooped so low before or since. Even so desperate an FDR wannabe as Obama is a Thomas Jefferson in comparison to this man. And, like all socialist systems of government, everything quickly began to harden into an immovable inflexibility. Mrs. Shlaes tells us "the New Dealer's economic failures were working to their own political advantage" (p. 267). The massive increase in the size of the federal government allowed FDR to build himself a formidable political machine, so well-oiled by patronage jobs, bribes, and handouts that "millions of voters [were] under obligation to him" (p. 375), making an election defeat impossible. 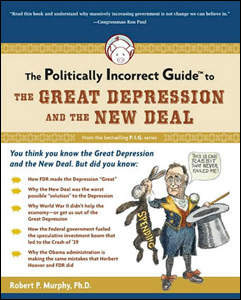 As Mrs. Shlaes persuasively argues, the Great Depression did not end because of the New Deal. Quite the opposite, "the New Deal was causing the country to forgo prosperity, if not recovery" (p. 263). FDR and his New Deal became vampires, living high off a Great Depression that his policies were feeding and keeping alive. So the answer to the current, popular question we all like to ponder, What ended the Great Depression? does not involve understanding "regime uncertainty," economics, or even Ludwig von Mises. The sad, simple answer is that America's Great Depression ended when Franklin Delano Roosevelt's heart stopped beating. "Roosevelt and his staff were becoming habitual bullies, pitting Americans against one another." The main lesson that I took away from reading The Forgotten Man is embodied in another William Graham Sumner speech, "Republican Government," delivered in 1877, six years prior to his "The Forgotten Man." Dr. Sumner's prescient despair for the American Republic's chances of survival ends on a note that perfectly encapsulates the devastating tragedy that was FDR. Speaking in Chicago's McCormick Hall, he warned that "the constitutional republic, however, does not call upon men to play the hero; it only calls upon them to do [their] duty under the laws and the constitution, in any position in which they may be placed, and no more." "Well, [Franklin D.] Roosevelt went much further than … Theodore Roosevelt … Wilson, and certainly Hoover would go. [FDR] was unconstitutional, they were mostly Constitutional, so that's the difference." If anyone from the 1930s is the "forgotten man," it is undoubtedly FDR. History has reduced him to a kindly, mythical, cardboard cut out. After one particularly crass public display, FDR bragged to his boys, "I dared them to hit me — and nobody did!" Seventy-five years later, Amity Shlaes sends him sprawling to the canvas by reminding us all what type of man FDR truly was. Amity Shlaes has bought FDR back to life in vivid focus, and I found barely a scrap in his words or actions to admire. Eleanor deserved better. We all deserved better. To give credit where credit is due, when it came to politics, FDR was an undoubted genius — but so were his contemporaries Stalin and Mussolini, so maybe that's not really much of a character reference. When it came to economics, he was crack-smoking stupid, and he doubtless caused much misery. But worst of all was his lawlessness. When it came to upholding the Constitution — the only thing an American president is sworn to do — he just didn't care. That is the central story of this book, and it makes The Forgotten Man one of the most radical takes on the Great Depression since Murray Rothbard. [bio] See [AuthorName]'s [AuthorArchive]. Comment on the blog.